Although still a small fraction of the renewable energy market, geothermal is one of the fastest growing, fueled by technological improvements and its ability to deliver a steady flow of energy unlike wind and solar. Since 2008, the number of geothermal projects online or under development has grown more than 200 percent, jumping from 83 to some 170. The epicenter of much of that development is in the Rocky Mountain West and California, according to Bill Vandermeer, U.S. Department of Energy project engineer. According to the Geothermal Energy Association, more than 6 million households and businesses in the United States run on geothermal energy. Half of those are directly connected to a geothermal power plant, while the rest rely on home heating pumps. Still, this represents only a small fraction of energy used in the United States. According to the Department of Energy, geothermal accounts for less than 1 percent of the country's power generation. Despite its relatively small part of the overall energy market, several regional firms are hoping to cash in on renewed interest. Boise-based U.S. Geothermal Inc., as one example, landed a federal loan in April from the U.S. Department of Energy to develop a geothermal power project at Neal Hot Springs in eastern Oregon. 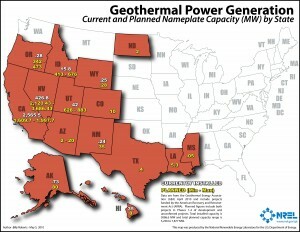 Currently, nine states produce geothermal energy power and 15 states are working on developing plants. The West's unique geography has made it the most advance when it comes to harnessing this energy as a heating source. Here, the geothermal temperatures tend to be closer to the surface of the earth, as seen by the number of hot springs and geysers in the region. However, Vandermeer said technological innovation is helping geothermal energy development move eastward. "The temperature is usually above 350 degrees Fahrenheit [for geothermal energy production to happen] but needs to be pushed down to 200 degrees Fahrenheit which will allow it to now move to the Eastern states," he said, adding West Virginia and Maine are considering new projects. There is also research in Alabama, Arkansas and Mississippi. Geothermal's also expanding its role internationally. According to the United States Geothermal Inc., 24 countries use geothermal to produce electricity and 70 countries use geothermal heating. They also said that some of the top countries in geothermal energy development are the United States, the Philippines and Mexico. In just the last year, the United States has seen a 12 percent increase in the overall number of geothermal projects under development and supporter hope that as more people learn about the benefits, it will only grow. "It can be a more widely used source of energy, but I am not sure the public knows of the benefits of using it," said Greg Mines from Idaho National Laboratory. Advocates argue that geothermal addresses one of the problems that have plagued other renewable sources, namely consistency. "Solar and wind energy are great, but geothermal can go 24 hours a day. With solar or wind you need the sun out or the wind blowing and at times coal of generators but geothermal energy is 100 percent on a continuous basis," Vandermeer said. The sudden growth of geothermal can be traced to the recent recession. In 2009, when the government enacted the American Recovery and Reinvestment Act of 2009, the $787 billion stimulus bill provided a large investment in renewable projects. The bill included a provision that gave homeowners a 30-percent tax credit for installing a solar energy system, small wind system, geothermal heat pumps or residential fuel cell and micro-turbine systems. "There is a lot more development primarily due to the incentives through tax credit," Mines said. Although, much of the development of personal geothermal systems are tied to the federal tax-credit program, Vandermeer believes geothermal industry has turned a major corner. "I think geothermal is on the front burner now," he said. Geothermal energy sounds, at its essence, pretty simple. "Geothermal, or ground source, heat pumps use the constant temperature of the earth as a medium to transfer heat from the building to the ground and from the ground to the building," Russ Hellem, owner of Energetechs in Missoula, Mont., explained. Hellem's firm installs geothermal and other energy systems in businesses and homes and said there are two different kinds of systems for geothermal energy: the open loop system and the closed loop system. "There is the open loop system where you drill a well and pull the water out of the well, run it through a heat pump, extract the heat from it and dump the water back into the ground," he said. It's "open" because it's a system open on both ends. But open systems also emit some air pollutants, including hydrogen sulfide, a toxic gas most people recognize by its rotten-egg smell. Along with this, open systems can emit trace amounts of arsenic and minerals, which can be released in the steam. In the closed loop system, there are no emissions because everything brought to the surface is returned underground. In the vertical closed loop system, "you bore holes in the ground and put a vertical pipe down the hole, average about 200-feet-deep per hole, and circulate a fluid through the pipe down and back," Hellem said. "As the fluid travels, it transfers the heat back and forth to the ground and to the building." Any of these formats provide a source of heat as well as cooling. In the summer, the same system can be used to draw heat from a house and back into the earth. This works the same way as a refrigerator, where a small compressor on the back is constantly removing heat from the refrigerator. For geothermal energy to work best, Hellem said the house should be very well-insulated and airtight. In fact, the amount of insulation in a house often determines how expensive the system is. He said the systems can range anywhere from $15,000 up to $100,000. "The more efficient the house, the smaller the system you need," Hellem said.